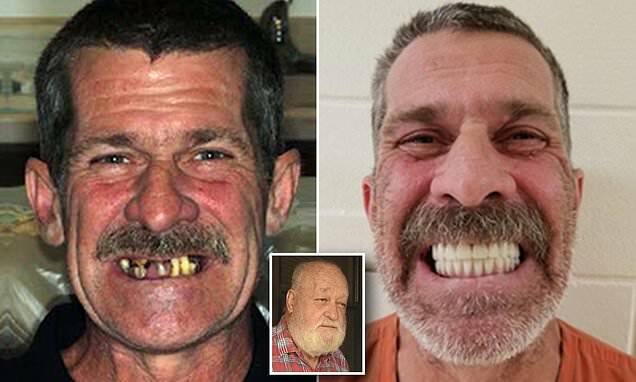 A homeless man in Central Florida flashed a brand new smile for a jailhouse photo, prompting additional charges of stealing another man's identity to pay for extensive dental work and a pricey pup. Timothy Powell is accused of using a DeBary man's information to secure a loan for more than $40,000, which he used to buy dental implants and a French bulldog. The new charges were tacked on while Powell was already in custody at the Volusia County Jail, after he was arrested for a separate alleged crime. The identity theft victim, who asked not to be named so something like this doesn't happen again, is now taking extra precautions to prevent future theft. 'I've just stopped using my credit card, and trying to take it day by day,' he told Fox News. The man whose identity was stolen was happy that police helped him get the matter sorted out, and he won't be liable for any of the fraudulent charges made to his account.